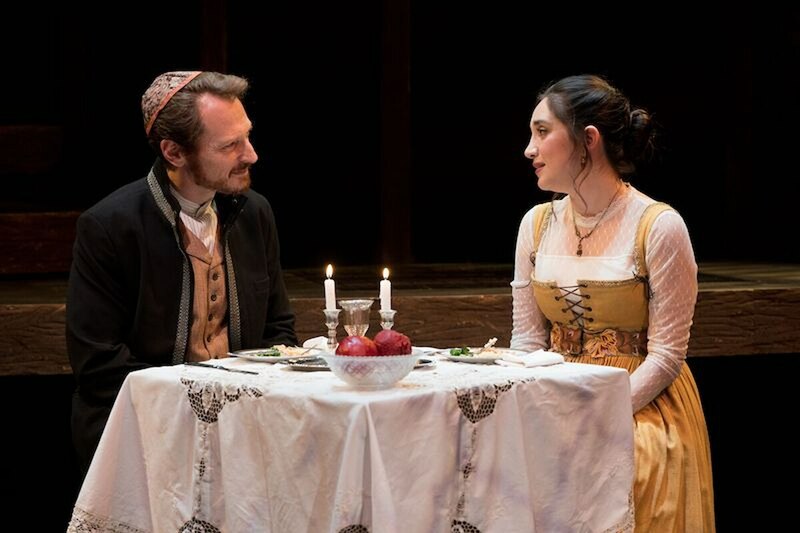 This new play explores Jewish heritage through pomegranates, Shakespeare's "The Merchant of Venice," and everything in between. It's a Jewish thing… or is it? Sarah B. Mantell’s “Everything That Never Happened” spins Shakespeare’s “The Merchant of Venice” on its head and then kicks it down a flight of stairs. “Everything…” tells the story of the Jewish merchant Shylock (Leo Marks) and his daughter Jessica (Erica Soto). Jessica falls in love with a Christian man, Lorenzo (Paul Culos), and devises a plan to escape the ghetto so that she might marry him. Mantell, in tandem with director Jessica Kubzansky, weaves a stunning web of a story that touches on everything from how to eat a pomegranate to how to cope with lost identity. “The Merchant of Venice” provides the bones of Mantell’s piece, but the muscle of the play comes from the father-daughter relationship between Shylock and Jessica. Jessica longs for a freedom that a Jewish woman cannot find in Venice in 1596 and wants desperately to leave, while Shylock aches with the fear that he is losing his only child. “Everything…” elegantly and heart-wrenchingly fleshes out a relationship that is barely seen in the source material. This is achieved, in no small part, due to excellent work on the part of Marks and Soto. The entire cast shines throughout the production; they are as gracious with each other as they are with the text. Marks brings an incredibly human life to Shylock, a character demonized in Shakespeare’s original text. Soto’s Jessica masterfully holds the weight of dozens of Jewish genocides on her shoulders without getting lost in her grief. Dylan Saunders is fantastic as the servant Gobbo, who appropriately assists with scene changes as much as he assists Jessica with her escape plan. Finally, Culos is unbelievably charismatic as Lorenzo, prompting the audience to fall in love with him as quickly as Jessica does. All in all, this play is unapologetically Jewish. The show uses Jewish cultural references in a way that critically engages the audience. It is sprinkled with Jewish prayer and ritual and the playbill contains notes detailing their purpose and meaning. Gobbo, a Christian, constantly asks Jessica if what she’s doing is “a Jewish thing.” Mantell does not let her audience forget the identity of her characters, even if they might forget it themselves. Even further, it is a play for the age of Trump– for a time when neo-Nazis openly and proudly call for the deaths of Jews; “Everything…” reminds its audience that Jewish people are here, we always have been, and we’ve survived worse. After all, it’s a Jewish thing. “Everything That Never Happened” runs now through November 4th, 2018 at the Boston Court Pasadena in Pasadena, CA. Tickets start at $20 for students and more information can be found here.